Accessing and Working with Financial Planning View - Learn how to work with the various options and tools in the Financial Planning view. Includes date picker, export to Excel, Summary mode, Expense type fields, etc. Tracking and Updating Project Financials - Track different aspects of your financials including budget costs, NLRs, etc. Begin your project planning by adding resources at the task level or by period using Resource Planning. You can perform this phase of the planning in the project’s Scheduling View. Then you can move to the Financial Planning View. Open the View Navigator and select Financial Planning. Select the Month, Quarter or Year view and then form the date range options, select the range. The default date range for the Time Phases is based on the Work Item time frame. Fin. Work Item Time Frame represents the Financial time frame for Non-Labor Resources as set in the Work Item's Financial Start/End fields. As a project manager, you work on many time periods. By collapsing the Project panel, you can see a bigger picture of the time-phased data over the course of the project. This is also handy when taking screenshots for documentation such as quotes and estimates. When in summary mode, the Project panel is not displayed. By switching to Summary Mode, you can see a grouped overview of all Non-Labor Resources. Expanding the NLRs shows the detailed listing of which Work Items the NLR is used in. Financial Planning does not calculate data from Shortcuts or Portfolio-flagged projects. Note: Manually Setting Budgeted Cost / Fixed Cost & Expected Revenue & Fixed Price values on work items override the totalling and rollup of linked Non-Labor Resources. It is highly recommended to use NLRs instead of fixed costs to take advantage of the additional visibility and forecasting they give you. Financial Planning can be run on Portfolio projects (Projects with sub-Projects). When doing so, all amounts are rolled up from the sub projects. Note: This option is available in Summary mode. Once you have chosen the Financial Planning view, you can select which data to focus on. A Monthly, Quarterly, or Yearly view of the budgeted allocation of your project throughout your resources (both Labor and Non-Labor). Update Non-Labor Resource amounts for projects, milestones and tasks using an Excel spreadsheet. Update time-phased data (planned and/or actual amounts) for existing Non-Labor Resources, on a monthly level. Save time when updating large plans. Easily import data from external systems. Note: The spreadsheet will include the visible data on the screen, with the currently selected fields. If you want to see the long term budget, select the Yearly view as opposed to the Monthly view, and the corresponding data will be exported to Excel. In the Financial Planning view, enable Summary mode. Click Export to Excel. Select Financial Summary or Flat File. For exported Flat Excels, you can now update Non-Labor Resource amounts, and use the Import option to update the data. Update time-phased data (planned and/or actual amounts) for existing Non-Labor Resources. Save the file. In the confirmation screen, you can further update amounts and the currency. If there are any errors, you will be prompted to fix in Excel and re-import. Add or remove fields to and from columns. Click the gear icon and select Labor Resources, Non-Labor Resources or Time Phase. Add or remove items, and click OK. If your projects are not billable, or if all work is always billable, you can remove Billable. If you do not track CAPEX and OPEX amounts, then you can remove the Expense Type. By removing the fields, you're only hiding them from the view, and not deleting their content, so you can show the fields when setting up the Financial Plan and remove them later to free up screen space. When exporting to Excel, the exported file will include only selected columns. Four standard fields provide insight into the total planned spend in your project’s Budgeted Cost. When requesting budget or creating new project proposals, it’s common to break out Labor vs Non-Labor costs, and CAPEX vs OPEX costs. This helps you manage the cost planning with your Finance team who use these amounts for overall budgetary & investment planning of the organization. Planned Expenses is included for backwards compatibility reasons only. If your organization is using Planned Expenses, it is highly recommended to plan moving this part of your budget planning over to Financial Planning with Time-Phase capabilities. The Budget Cost amounts do not yet track Expenses logged in the Expense module. Replacing customizations - If your organization is currently using CAPEX / OPEX Work Items app from the Apps Marketplace, you may be able to replace your usage of these custom fields with these new standard system capabilities. Expense Type is a Work Item-level field to support the appropriate categorization of Labor efforts and costs, governing whether they should will be calculated as part of the CAPEX budget or the OPEX budget. The categorization of the work itself enables accurate calculation of Budget Cost rollup fields. The following calculated fields in Work Items roll up from financial planning time-phased fields. These include Year to Date actuals and forecasts, for labor and non-labor resources, by Copex and Apex, etc. Add resources as usual using the Schedule view and Resource Planning utilities. Upon first entry for your project’s Financial Plan, you must click Refresh Labor to generate the Labor Resource budget. Time-Phased Fundamental 4 Financial Planning fields roll up into Work Item / Project fields. Forecast Cost and Forecast Revenue are visible, but not currently used for Labor Resource calculations. Add non-labor items on the Project, Milestone or Task levels. Click Add Non-Labor to add a new non-Labor item. The categories for Non-Labor items are defined when setting up Non-Labor items. Tip: While it is possible to add NLRs from the Add Related tab in Project list or Project detail views, it is recommended to add new NLRs from the Financial Planning view, as it’s easier to filter more quickly by category. This is more efficient when working with larger collections of NLRs. Once you add a Non-Labor Resource to a project or work item, its project-specific time-phased fields become available in the Financial Planning view, as well as whether it’s Capex/Opex, Billable, and its Expense Type. You can add or update time-phased Non-Labor Resource amounts in the Financial Planning view for monthly, quarterly or yearly resolutions. The time-phased data is where you plan and track the financial amounts of the Non-Labor Resources by time period. Non-Labor Resources are planned and tracked as currency amounts, and do not have any unit calculations. The NLRs can have varying amounts by time period, and they do not have any calendar, capacity or availability constraints on them. You can also attach files to NLRs. This can be used for any purpose, from price quote documents, if you are using the NLR for materials purchased from third parties, to web links to detailed specifications and documentation about the Non-Labor Resource. Click Refresh Labor after making changes in the plan to recalculate the budget and financials. The plan is also recalculated every night. A time stamp exists so that you can see the last update time. For existing projects, Labor Budget plans will be automatically generated. You can now see resource assignments * hourly rates calculated for labor budget costs and actuals calculated using timesheet reports + rates. After building the financial plan, you can manage, update and track labor, non-labor and NLRs to see how they affect the budgets, estimates and actual costs. 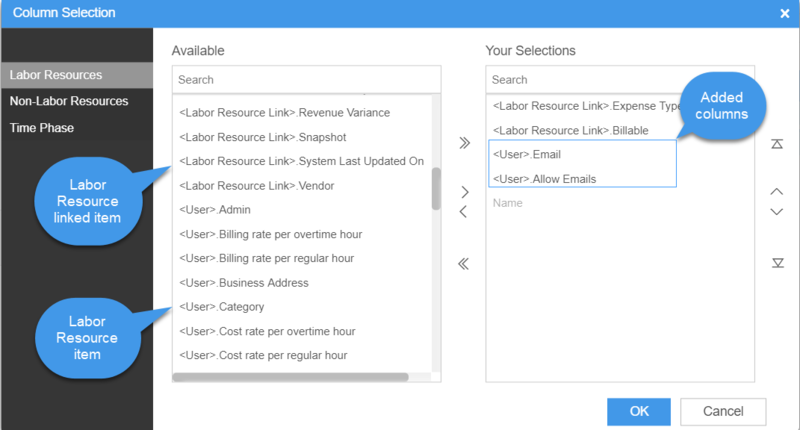 Labor Costs are refreshed daily at 2 a.m. and can be manually refreshed on-demand, by clicking Refresh Labor. For planned Budget Cost & Budget Revenue fields, the calculation is derived from the Clarizen work plan: work * hourly rates. For Actuals, the Actual Cost and Actual Revenue fields are based on reported timesheets. In Summary Mode, see full Labor amounts aggregating from tasks (where work is defined) or project assignment. Professional Services organizations’ customer-facing Projects might never be tracked as Capital or Operating expenditure. Definitions vary by jurisdiction and industry. Check with your Finance teams. Labor: An Expense Type field for Work Items controls whether the Labor amounts for the assigned resources on the task are classified as Capex or Opex. Non-Labor: The expense Type is inherited from the Non-Labor Resource itself, but can be overridden per link to work item in the Financial Planning view. Add non-labor budget amounts directly in the Financial Planning view. Labor actuals are always calculated by reported timesheets. When reporting time on tasks, we only see the Project's summarized labor costs in Summary mode. If needed, add additional fields to the view. Financial Start and Financial End fields set on Work Items allow you to manage and align the project financial period, and make sure amounts are added only within this timeframe. With these fields you can set the financial start and end date offsets in months. These fields are relative to work item dates, and by default are set to 0, which makes them the same as the work item months. As these fields represent a relative offset of the work item dates, and not fixed, they are always aligned with the project even when shifting dates. Forecast Cost and Revenue amounts are manually-entered and do not currently aggregate into Project fields. Use them to keep track of intra-month amounts before month-end actuals are reported. Manually-set values in Clarizen always take precedence over calculated values and rollups. As you may have existing financial data which you want to now time-phase, budget “conflict” indicators help you identify any manually-set values which block Financial Planning time-phase rollups. As soon as there is a discrepancy in financial allocation, you will see an indicator icon in the work plan section of the page as well as a "manually set" icon at the top of the corresponding column on the time phases. Hover over the icon to reveal a warning that explains the discrepancy. The indicators show both in the Work Plan section of the Financial Planning view and on the relevant column headers. Depending on which columns you are showing on the time phases, you might not see all the column header indicators. Hovering over the indicator will give you detail of what the Manually Set value is and what effect it has on the corresponding Financial Planning field. Note: If you are managing multi-currency projects, the amount shown is the amount you have manually entered in the work plan. Example: Your work item's Cost Currency Type is USD, and Revenue Currency Type is EUR, but the Fixed Cost has been set as 1000 GBP. The amount shown in the indicator will be 1000 GBP.